The following is intended only as a general overview of the federal airspace classification system. The more detailed knowledge of the subject required in private pilot training would be valuable to the ultralight pilot as well. Suggestions for further study are given at the end of this article. For someone with a general aviation background, all this may seem elementary, but, if you have been trained only in ultralights, you may need more information about airspace classifications. There is no requirement in the United States that ultralight pilots have this training, but it is mandatory in general aviation. This is fine so long as you just fly for fun around the local field where you trained, but sooner or later you will want to visit another field, or try a cross country flight. When you do, before you do, the time has come to study airspace classifications. Do the homework before you go, while you are still on the ground. The sectional chart is your best guide to airspace classifications in your area. It is hard to imagine a piece of paper that contains more information per square inch than a Sectional Aeronautical Chart or "air sectional" as they are called. This map offers information of critical importance to pilots. Note that a sectional uses a scale of 1:500,000. Pick one up for about $8.00 at any pilot shop; you will find these shops listed under aircraft equipment and supplies in the yellow pages. Also, you can visit your local airport's Fixed Base Operator (FBO) where flying lessons are offered and pilot supplies are sold. They will also stock World Aeronautical Charts (WAC) that cover a wider area with a 1:1,000,000 scale and VFR Terminal Area Charts with a 1:250,000. The sectional, however, is a basic tool. Sectionals are updated every six months. Check the expiration date printed on the sectional, and do not use an older sectional for flight planning. The airspace in the contiguous 48 states is mapped out in 37 different sectionals. In some areas, like Las Vegas, Nevada, you need the Las Vegas sectional, but if you fly south a few miles, you will be off the chart and may need the adjacent chart. Someone flying near Cleveland, Ohio needs only the Detroit sectional unless he is on a long cross country. A flyer based in mid Florida might need both the Jacksonville (northern) and the Miami (southern) sectionals. Fortunately, any area sectional you buy has a map of the U.S. showing the area covered by each of the 37 sectionals. From a certain ultralight field in Nevada, a pilot does not even have to leave the area to get into forbidden airspace. Looking at the Las Vegas sectional, you could tell that a layer of Las Vegas' McCarran Airport airspace -- Class B airspace that is forbidden to ultralights -- extends from 8,000 to 9,000 feet mean sea level (MSL) above this ultralight field that, itself, sits at about 1,700 MSL. With a few gallons of gas and some determination, a pilot could be playing tag with commercial jets approaching or leaving McCarran's southern reaches. He would also be breaking the law: Federal Aviation Regulations have the force of law, and fines of up to $1,000.00 have been levied against violators. Many ultralight airparks in the United States have a similar setting near large urban areas. How do I tell which airfield has a control tower and which does not? What is the highest elevation of any mountain, tower or radio antenna in my area? If I have a radio, what frequency do I tune when approaching any given field? What is the field elevation of a certain uncontrolled airport? Where, exactly, in my area can I legally fly? Is there a parachute or glider area nearby I should look out for? What about military training routes where I might meet a low level training jet coming at me? Your area sectional can answer all of these and many other critical questions, if you are willing to take the time. Airspace is not so complex that it is beyond the understanding of anyone who has the ability to learn to fly an ultralight (using proper instruction), so do not be intimidated. On the other hand, being deliberately uninformed is no excuse. The thing to remember is that relatively little of the surface area of the United States actually lies in controlled airspace, so there is very little of the U.S.A. over which ultralights can not fly if we know the system, although restrictions on altitude may apply.. To get the most out of the sport of ultralighting, we need to understand and obey basic airspace regulations. A high percentage of uncontrolled airspace is overlaid by controlled airspace, and this puts either a 1200 AGL (above ground level) or 700 AGL ceiling on what is called Class G uncontrolled airspace. Virtually all of the eastern United States has overhanging Class E controlled airspace. We will discuss the ways to recognize various types of overhanging controlled airspace as we go along. Ultralights can legally fly with "no strings attached" only in something called Class G airspace (except over those forbidden congested areas, of course). Also, with a few exceptions and conditions, ultralights may use Class E airspace. We will cover these later. By the way, there is no Class F airspace in the United States, although there is in Canada and in other countries. In this article we will cover A, B, C, D, E and G airspace as well as certain "special use" areas in the United States. Again, the sectional map is your best friend in finding out where one kind of airspace stops and another begins. If you have never studied an air sectional, now would be a good time to get one so that you can use it here as we go along. It is the ultralight pilot's individual responsibility to be aware of all relevant airspace regulations once he has finished training, even it the instructor did not cover this material. In the event of a violation or accident resulting from ignorance, ignorance can and will be held against you. Question: "If I can fly only in Class E and G airspace, why bother me with other classes?" There is no law in the U.S. that says you must, but ultralight flying is self-regulated; self-regulation begins with the individual pilot. This article on airspace is an invitation only; if you finish and understand the whole article, the answer to the question above should be obvious. Class A airspace is not shown on your sectional. It covers the entire nation, so all we have to remember is that its lower limit is 18,000 MSL. The term "controlled airspace," by the way, doesn't mean that somebody or some agency is up there controlling traffic, but controllers have a pretty good idea of what is up there. Use of our national air traffic control (ATC) service is mandatory in Class A airspace that begins at 18,000 feet MSL and extends upward to 60,000 feet MSL. Altitudes at 18,000 feet MSL and above, in Class A airspace, are commonly referred to in thousands of feet as "Fight Levels," abbreviated FL. For example, flight level two zero zero, or FL 200 = 20,000 feet MSL, FL 600 = 60,000 feet MSL, etc. The United States, of course, does not own or control airspace outside its territorial limits, but our government has extended Class A airspace out to twelve miles from the coast of the contiguous 48 states and Alaska. By the way, if you fly into Mexico or Canada, or if you want to rent an ultralight overseas, do not assume that you understand their airspace system. It will be similar, but homework is required. know precisely which aircraft is which, and to know the altitude of each aircraft. Pilots in Class A airspace are under the positive control of ATC, and the entire flight is controlled by radar equipped ATC stations along the way. Flights are "handed off" to local control as they approach their destinations. Memory aid: Class A airspace = Above, as in 18,000 and Above, as in high Above everything else. Class B airspace surrounds the nation's busiest airports and usually goes as high as 10,000 feet MSL, in some cases even higher. The uppermost level of Class B airspace may extend horizontally with radius of up to a 15 nautical miles (about 17 statue miles) around the airport tower. There is, however, no universal set of Class B dimensions since the flow of traffic, geography and other considerations determine the exact architecture of each Class B area. A sectional or a VFR Terminal Area Chart is very helpful in understanding the design and lateral dimensions of each Class B airspace. Theoretically, an ultralight might fly above Class B airspace, but that would be extremely dangerous, and there is no practical reason for doing it. Besides, you would be flying over a congested ground area and, in certain areas, through relatively congested airspace as other aircraft are funneled through narrow approach and departure routes. On your sectional, horizontal Class B airspace limits are outlined in concentric solid blue circular lines that may be indented or extended in certain places due to geography or air traffic routes. The top and bottom of each layer of airspace, as you can see, are given in what looks like a fraction; for example, 100/80. That means that this particular layer of airspace lies between 10,000 and 8,000 feet MSL. A two dimensional sectional map can only show you the horizontal outlines of different layers, you have to use the fractions to visualize the vertical dimensions. If it helps, close your eyes and try to "see" the architecture of the different layers. If you try to think in pictures rather than in words, that may help. Imagine an "inverted wedding cake." with at least three layers. Check your sectional and you will find that the surface area of a city lying in Class B airspace is colored yellow as are all cities on the sectional. Obviously, this is what the FAA would call "congested" area, and ultralights may not fly over congested areas even if they were not in Class B or other controlled airspace. Visual clues and good judgment are your best guides for avoiding ground congestion. High altitude Class A airspace is the home of commercial air traffic, most of it consisting of modern jet aircraft. Jet engines like the thin air that makes for much more economical fuel burn on long flights, but when jets and other complex aircraft get near to where they want to be, they have to start coming down miles before they reach their destinations. As they descend toward major cities, they enter a series of step downs (or step ups in the case of departing aircraft). This is why Class B airspace around major airports is shaped like an upside down wedding cake with several expanding layers. As commercial traffic descends below the 18,000 foot floor of Class A airspace toward the top of Class B airspace surrounding the nation's largest cities, it does so under Air Traffic Control's approach control. If you are flying an ultralight, you do not want to be involved in any of this. However, ultralights can and do fly beneath layers of overhanging Class B airspace. Just be sure you understand the sectional for your area, and then fly below the heavy traffic that may be flying in Class B airspace above you. Ultralights are not permitted in class B airspace although some operators have reported that ATC has granted permission for individual flights. In fact, it may seem that there are few places where ultralights are permitted, but this is far from the truth. The actual percentage of territorial United States over which ultralights cannot legally fly is very small. The problem is that they don't paint big markers on the ground to tell us where we are allowed to fly, and they don't have any way of marking the different altitudes at which one kind of air space ends and another begins. A good altimeter can be an essential tool. You might be safe and legal at 500 feet AGL in a certain area but dangerous to self and others at 1,300 feet AGL over the same spot on the ground. It is the ultralight pilot's responsibility to be aware of the type of airspace through which he is traveling at all times. The point in learning about airspace, as far as beginning ultralight pilots are concerned, is primarily to stay out of and avoid Classes A, B, C and D, and restricted "surface area E" as well as certain other types of special use airspace. So, we can skip for now the rules used to navigate in Class A, B, C and D airspace since we cannot legally fly there without special permission. You cannot, of course, avoid or stay out of what you cannot recognize, and that recognition depends on your knowledge of the sectional. The other important reason for knowing the airspace around you is that you can often legally fly under forbidden airspace to get where you want to be. At the airpark near Las Vegas mentioned earlier operators do that all the time, but most of them do understand "heavy, heavy what hangs over!" Many of the fields and airparks where ultralights fly, then, are under overhanging layers of Class B airspace. If they fly too high, or if they fly just above the surface toward a major city airport, the ultralight will penetrate the Class B airspace, and that may set off lots of alarm bells with the FAA. The inner circle of Class B airspace extends all the way to the surface. The outskirts of cities like Portland, Oregon and Seattle, Washington are surrounded by many delightful strips where small planes and ultralights fly, and their pilots know pretty well what to avoid in terms of location and altitude. Pilots who fly near major Class B airports may prefer to use a VFR Terminal Area Chart since these depict a smaller area with much more detail using a scale of 1:250,000. If you fly from a field that is under or near Class B airspace, you should study your sectional or Terminal Area Chart to memorize landmarks that might help you recognize the locations and altitudes of various sections of Class B space. General aviation aircraft, as distinct from ultralights, may fly into Class B airspace by first getting required permission via radio and obtaining ATC clearance. A transponder must be in place and set to an assigned transponder code. There are a lot of other rules that apply, but what ultralight pilots must do, if they fly in the vicinity of Class B airspace, is to learn to use the sectional to visualize the shape and extent of the various layers of class B airspace so they can avoid it. There really is no other way than to sit and study carefully the solid blue concentric rings on the sectional that indicate the expanding layers of Class B space, layers that expand with altitude as one goes farther out from the airport area. The expanding rings or layers are actually a break for other noncommercial air traffic and for ultralights. They are there to allow the big planes to come up or down under control of ATC and yet allow uncontrolled traffic to fly beneath them. Classes E and G airspace (discussed below), where ultralights may legally fly, usually lie beneath these layers of Class B airspace. In this way, with the "upside down wedding cake" architecture, the FAA gives heavy commercial traffic what they need without restricting other traffic closer to the ground. Intruding into Class B airspace in an extremely serious matter. You may endanger the lives of many others since a fully loaded passenger jet carries hundreds of people. While a violation of Class D or Surface Area Class E space (discussed below) might bring only a strong lecture, a violation of Class B or Class C will almost certainly bring strong penalties. In your memory, let B stand for Big Time or Big City airspace. On your sectional, horizontal Class C limits are shown by solid (as opposed to dashed) magenta circles, and most class C airspace around mid-sized cities has the same dimensions: a layer with a10 NM radius sitting on top of a layer with a 5 NM radius.. The floor of the upper layer is usually 1,200 AGL with a ceiling of 4,000 AGL. Since the architecture of Class C space is usually the same, there's no need for the altitude fractions. But, wait! Here's Tucson, AZ with what looks like a fat hour glass, two Class C circles trying to eat each other, each with its own magenta outline. No problem, except if you assume that no Class C airspace ever overlaps another. In the Tucson area there is a controlled city airport not far from a military airfield. Their control areas overlap. By the way, you do not want ever to have to land on a military airfield except in a real emergency. They do take live prisoners, but due to extensive paper work they may hold your airplane for a very long time if they think you were kidding around. If "B" stands for "Big Cities," let "C" simply stand for Cities. The cities under class C airspace are our mid-sized cities. The towers at these fields are equipped with radar -- something that smaller controlled fields (Class D airspace) do not have. Ultralights may not fly in Class C airspace without special permission from ATC, and that should be obtained in advance by telephone (although some controllers will accept a radio call). Although the city involved may not be as big as New York or Washington, D.C., it will usually have heavy jet and commercial traffic coming and going. Oh, the telephone number to call? Look in the phone book under United States Government for the Department of Transportation, and under that you will find the Federal Aviation Administration. Don't be surprised if they say, "No," or insist you have a Mode C transponder. A lot may depend on exactly where and when you want to fly within the area. There are, as we have said, two parts to Class C airspace. Imagine a two-layer wedding cake sitting upside down above the tower. The inner circle extends from the surface upward to 4,000 feet above the airport surface in a circle with a 5 nautical mile radius (about 6 statue miles). The upper or second part of Class C airspace is a ring around the central area extending from 1,200 feet AGL to 4,000 feet AGL in a circle with a 10 nautical mile radius (about 12 statue miles). Have you noticed that your sectional has a conversion scale that shows the difference between statue and nautical miles? As with overhanging Class B airspace, you may fly beneath the upper 20 nautical mile wide layer of Class C space, but never into it. Nor may you fly into the inner 10 nautical mile wide core that extends to the surface around the airport ( at least not without prior permission from ATC for each flight). If, for any reason, a pilot plans to penetrate any part of Class B or C airspace, he must be in radio contact with ATC. For general aviation aircraft, a working transponder is required in addition to radio contact with ATC. Ultralights, of course, are never permitted to enter either without that all important prior permission. Small city airports with control towers are usually designated as Class D airspace. Associate "D" with "Diminutive" or "Dime-sized" cities if you like, and do not go there without permission either. Commercial and other IFR traffic may be flying into these fields, and there is often much general aviation activity and pilot training. Look over your sectional and find several Class D fields. The field silhouette itself (not the city) will be pictured in blue -- as all controlled fields are -- with a dashed blue circle around it having a diameter of five statute miles to show the airspace. (Do not confuse it with an uncontrolled or non-towered field, to be discussed later, that is depicted in magenta.) By now you have probably noticed that the runways of any airport are drawn to show their direction in terms of the compass, and that runway length is also given. There is more information to look for as well, but back to Class D airspace. The ceiling of Class D airspace generally extends upward to 2,500 feet AGL over the airport surface. Some Class D fields have little extensions, what look like cogs on a wheel. The entire airspace may look like a key hole with one or more extensions out from the five-mile circle. These extensions of Class D airspace accommodate approaching and departing IFR flights that use standard approach/departure routes. If the extension is outlined with blue dashes, assume that it's controlled airspace all the way to the ground: no ultralights here, thanks, without permission. If the extension is outlined in magenta dashes, the extensions are what is called Class E airspace and you may be able to fly beneath their lower limit if you know for sure where the overhanging controlled airspace begins. Extensions more than two nautical miles from the boundaries of Class D airspace are Class E airspace, and will be shown in dashed magenta lines. Their floor will be 700 AGL, below which lies Class G (uncontrolled) airspace. Ultralights are not airplanes, and they certainly do not have the performance characteristics of airplanes. The FAA does not consider them to be airplanes. For these reasons it is generally unwise for an ultralight to enter Class D airspace, or to try to fly over it, but there are exceptions. Flying over Class D airspace may not pose problems for the experienced ultralighter unless it violates the rule that ultralights must avoid flying over congested areas on the ground. It is customary for general aviation traffic that is just passing over or near a Class D field, but not planning to land there, to call the tower (the frequency is on the sectional). Such a courtesy call lets ATC know there is traffic out there in the general vicinity. Remember, a Class D airspace tower may have no radar and may, except for the controllers' eyes, be blind. If you have an aircraft frequency radio and understand radio communication procedures, it may be wise to inform a nearby Class D tower where you are and where you plan to go. To enter Class D airspace, however, you need prior approval from the tower, usually by telephone. You generally cannot just fly up and knock on the door with your radio call without prior contact. If your ultralight base is under overhanging controlled airspace or within a few miles of it, you must be precise about where, and at what altitudes, you may and may not fly. Prepare a sheet to take along that lists local landmarks that will help you recognize the limits of such areas. These are not difficult tasks if you spend some time with your sectional and perhaps talk with other pilots who know the area. It would be valuable if ultralight clubs could devote at least one meeting every year to a review of the area sectional and of local airspace. As part of your general ultralight training, it is an excellent idea to telephone the tower at a local controlled field to arrange a personal visit to the tower. This is usually more easily done at a Class D area than in a larger airport. In a Class C tower, however, you will get the chance to see what a radar display looks like, and you may be surprised by how crowded with aircraft the area is. Most tower personnel will welcome you, and you can be an ultralight ambassador of good will. If you ever attend an Oshkosh fly-in you just might be able to talk your way up into the tower, and if you do, you will have an experience to remember for a lifetime. In an active tower you will see why ATC saves lives and expedites the flow of traffic. Summarizing what has gone before, the ultralight pilot must be able to determine where controlled airspace lies in order to avoid it, and he is never permitted to enter Class A, B, C, D or surface area E airspace without prior permission. You are far more likely to get that permission for Class C and D airspace than for the very busy Class B fields. Some legal eagles may say that if the tower at a Class C or D field shuts down at night, then it is no longer legally controlled airspace and so it's O.K. to fly there. Bad advice! Ultralights cannot legally fly at night. Also, the fact that the tower is not operating does not mean that IFR flights in and out stop. You will be flying with some pretty heavy iron without good reason. A final reason not to expect to fly into many controlled fields is that, in order to get there, you often have to fly over those forbidden congested areas of a city. Even if you get permission, you must always obey the rules set down in FAR, Part 103. In some rather unusual situations, Class D ATC may be shut down during daylight hours; if there is no weather reporting service available, then technically it becomes regular Class E and the airspace below 700 MSL becomes Class G. To take advantage of such an unusual exception you must be familiar with local practices, so the rule has to be, check before you enter. Controlled airspace is officially defined by exclusion, which often does not tell you much. By that reasoning, Class E airspace is controlled airspace that is not Class A, B, C or D or G airspace. Not too helpful, but you can be sure that there is a lot of Class E airspace, so much that one could think of it as "E" for Elemental or Everywhere airspace, the airspace out of which all other types are carved. Its volume is vast. If we ignore the upper cover of Class A airspace, it is safe to say that there is a lot more E than all the other kinds combined. Ultralights fly freely in Class E space, but never without educated caution. The major exception is: FAR, Part 103.17 -- "no person may operate an ultralight vehicle within the lateral boundaries of the surface area of Class E airspace designated for an airport (having ATC) unless that person has permission." Class E almost always has one of three lower limits: 700 feet AGL, 1200 feet AGL or the surface itself at many non-towered airfields. The upper limit of Class E airspace is the floor of Class A space, 18,000 feet MSL, or the floor of any other overlaying controlled airspace (there could be Class E airspace under one or more of the outer layers of Class B or C airspace.) One way to think of Class E is to think of it as the total world of airspace below FL 180 with all the relatively small Classes B, C, D, and G carved out of it. Class E, in that way, is universal or Elemental airspace. The floor of Class E space can always be determined from your sectional and is set depending on various factors such as surface features, approach routes, traffic patterns around uncontrolled fields, and congested areas on the ground. The clue in finding the floor of Class E is in the coloring. Some Class E airspace acts as a buffer zone for aircraft approaching an airport. It can be either an area around an airport, or approach corridors to an airport. Ultralights are allowed into this type of Class E airspace which is found on the "fuzzy side" of blue bands and has a floor of 1200 AGL, or on the "fuzzy side" of magenta bands and has a floor of 700 AGL. In some cases, the floor may be non-standard in which case the actual floor is written in the blue band on the sectional. Some Class E airspace, called "surface Class E," is indicated by dashed magenta lines around the airport in question. Here the floor of E goes all the way to the surface, and ultralights are not permitted without permission when or if ATC is in operation. Class E (controlled airspace) begins where low lying Class G tops out (see below), and Class E goes to 18,000 MSL where it meets Class A, or to any lower overhanging Class B or C airspace. Class E also begins above Class B, C and D controlled areas and extends upward to 18,000 MSL. So, we can always be sure that Class E tops out at FL 180 (technically, at 17,999 feet MSL), but we have to look at the sectional to find the floor of E in any given area. Class E airspace reaches the surface at uncontrolled or non-towered fields as shown by dashed magenta lines attached to the circular area that indicates the field's airspace. When Class E airspace is associated with a controlled field, ATC permission is required to enter. Only "surface area Class E" has restrictions applicable to ultralights. This is Class E that goes all the way to the surface at and around non-towered airports that have weather reporting capability. Other Class E is open to ultralights, but has stricter weather minimums for VFR flight than Class G (below). Below 10,000 AGL in Class E airspace you need three miles visibility; and you must maintain minimum distances away from clouds: 500 feet below, 2,000 horizontally, and 1,000 above. It is important to understand that Class E airspace reaches the surface at some non-towered airports, but by no means all. Look at the sectional -- if a non-towered airport is circled by a broad magenta band with one "sharp" edge and one "fuzzy" edge, then the enclosed airspace around the airport is Class E with a floor of 700 feet AGL, and the airport surface up to 700 AGL is Class G; ultralights are permitted with no restrictions. However, if in addition to the broad magenta band, there is a dashed magenta line around the airport, then this is Surface Class E and ultralights require permission if the field has weather reporting services. Frequent reference to the "Key" section of your sectional will remind you of all of these symbols. Class G airspace is a mantle of low lying airspace beginning at the surface. Class G is airspace that is completely uncontrolled and in which an ultralight flies most comfortably. This low lying blanket of uncontrolled airspace only ends when it meets Class B, C, D airspace, all of which extend to the ground at airports. Class E extends to the surface at some uncontrolled airports. Here is a source of unnecessary confusion: Class G space can be found at very high altitudes! Why? Because it follows the contour of the earth. It may extend from the surface upward to only 700 or 1200 AGL, but over high terrain like mountains it takes you up there in terms of mean sea level. In some areas of the country, mainly in the unpopulated West, Class G may extend up to 14,500 AGL. No ATC service is ever required (except for aircraft flying IFR) in Class G airspace. Since there are no restrictions on VFR flight in Class G, let "G" stand, if you will, for "Go-for It" airspace. Class G's uncontrolled space follows the surface elevation and allows us to fly up to 700 or 1200 AGL in completely uncontrolled space; so, over a mountain that is, say, 10,000 feet high, we can stay in Class G airspace flying over the mountain, even at 10,000 plus feet MSL. If we find a mountain that rises to 14,500 MSL, we cannot fly over it and stay in Class G because G can go no higher than 14,500 MSL ever, anywhere. If you're comfortable flying over very high mountains, there is no great problem in entering the overhanging Class E space. By the way, mountain flying is a specialized kind of flying that requires training and preparation. Although it's legal, it may not be wise for the unprepared. There are plenty of ultralight pilots who live and fly at high elevations, so it may be worth the extra effort. Get specialized training. A private pilot flying an FAA registered and N numbered aircraft under visual flight regulations (VFR) needs no permission to enter Class E controlled airspace. Ultralights, as well, can and do fly in Class E airspace without any special permission since they always fly VFR, but the pilot should be aware of VFR flight regulations. Also, be aware of restrictions at certain airports with surface area Class E. Below 10,000 feet AGL in controlled airspace like Class E, VFR calls for the aircraft to fly 1,000 feet below any clouds and with at least 2,000 feet horizontal distance away from clouds. These rules protect you from IFR aircraft emerging from clouds. Also, in Class E, the pilot must have at least three statute miles of visibility and maintain visual contact with the ground at all times. In Class G uncontrolled airspace closer to the ground, the VFR pilot must remain clear of clouds and have at least one statue mile of visibility. In other words, avoid flying in heavy haze or below a very low cloud deck through which descending aircraft flying IFR might penetrate without warning. To enter any Class E airspace associated with a controlled field, ATC approval is required. Using proper precautions, ultralights may fly into non-towered fields under Class E space unless the field is privately owned and operated. In that event, the owner may forbid them. Notice that on your sectional some uncontrolled fields are shown as a circle with the letter "P" inside; P stands for private. As an exercise, try this one: what does an "F" in an uncontrolled field circle indicate? The answer is on your sectional. to indicate where Class E airspace reaches the surface. To learn the floor of any other Class E airspace one must examine the sectional, and here it can get a little confusing. As stated above, Class E with a floor of 700 AGL is enclosed with a fuzzy magenta band while Class E with a floor 1200 AGL or greater by a fuzzy blue band. The confusion is best laid to rest by working directly with the sectional, not trying to use words alone. After a bit it becomes easier to read the language of the sectional. It does have its own symbol language that must be learned. In practical terms, however, an ultralight may move up and down between E and G freely under VFR conditions. In IFR conditions, stay home and do maintenance on your ultralight. On your sectional you will find large areas that may or may not be associated with an airport but which are controlled Class E areas with a floor of either 700 or 1200 feet AGL. A fuzzy band of blue with a sharp outer edge and a fuzzy inner edge shows that the enclosed Class E airspace has a floor of 1200 feet AGL. Similarly, a fuzzy band of magenta with a sharp outer edge and a fuzzy inner edge shows that the enclosed Class E airspace has a floor of 700 feet AGL. Another way of saying this is to say that it is really Class G airspace that is being shown, and that the Class G space has a ceiling of either 1200 or 700 feet depending on the color of the fuzz. Using due caution and following proper VFR procedures, ultralights move freely back and forth between G and E, but, if you really want to reduce your chances of ever meeting up with general aviation aircraft, stay low and slow until you build hours and experience. A private pilot approaching a non-towered (uncontrolled) field will attempt to call the field's FBO (Fixed Base Operator��the guy who sells the gas, manages the field and provides the restrooms) on the published radio frequency (it's on the sectional) to announce his location, intentions and to ask about field conditions. This also informs other aircraft in the vicinity using the same published frequency of your presence and intentions. This frequency is called "unicom." Ultralights and private aircraft without radios can land unannounced at these fields, but it would be better for all if the ultralight followed accepted radio procedures. Some fields do not welcome ultralights, but if the field is supported in any part by federal funds, ultralights cannot be refused unless the airport manager can demonstrate that they present a safety hazard. Also, many uncontrolled fields have established different patterns for general aviation, gliders and ultralights. The sectional does not tell us the pattern for any given field, but the Airman's Information Manual or a recent Flight Guide are good sources for this kind of information. We cannot cover them here, but there generally are ground markings at airfields to indicate an approved pattern. Victor Airway -- A Victor Airway is a special kind of Class E airspace. It is an airway based on "very high frequency omnidirectional range" or VOR stations that radiate a signal in all directions, a signal aircraft use in navigation. These stations are usually located at or near airfields. North-south Victor Airways have odd numbers while east-west airways have even numbers. These federal or Victor Airways are used by both IFR and VFR aircraft. The airspace set aside for a Victor Airway is eight miles wide with a floor at 1200 AGL; they extend up to FL 180. Victor Airways are shown on your sectional by faint blue lines in which is printed the V designation along with the airway number. Ultralights should exercise extreme caution in crossing a Victor Airway or in flying along one. Keep up a good visual scan and stay below the 1200 AGL floor. Also, be sure you can distinguish a Victor Airway from a Military Training Route (see below). Military Training Routes -- MTRs are depicted as thin, light gray lines on the sectional. Each has its own identification, and the identifier has two parts. "VR" means that pilots flying the training routes will be flying under visual flight rules. "IR" means the pilots will be flying under instrument flight rules (look out for these guys). The second part of the identifier is either a three or a four-digit number. Four digits means the route will be flown at or below 1500 feet AGL, an especially dangerous level for ultralight encounters. A three-digit number means the route will be flown above 1500 feet AGL. Thus, VR-1260 means a training route flown under VFR at a relatively low level. IR-141 would be a route flown under IFR conditions above 1500 feet AGL. A jet fighter traveling toward you at over 300 miles per hour can be very hard to see, so it's a great idea to keep any local MTRs fixed in the back of your mind, and to be especially alert when crossing an MTR. permission should be obtained by the controlling agency. Your sectional has a table that gives the floor and ceiling of Prohibited Areas as well as the times of use and the controlling agency. Warning Area -- This is a hazardous area that lies over international waters, beyond the three mile coastal limit. Long, over water flights by ultralights into these areas are unlikely. Military Operations Area (MOA) -- These large areas of the country are shown on your sectional as enclosed by a line of magenta hash marks with a sharp outer edge. Military operations such as training exercises come and go. Permission to fly in an MOA is not required, but a pilot may determine the hours of any current activity by calling the nearest Flight Service Station (FSS). Dial 1-800-WXBRIEF. Alert Area -- An Alert Area may involve high general aviation traffic, unusual air operations or frequent student training. The area will be marked with a blue border with a word or two of explanation. Controlled Firing Area -- Here there may be military activity such as artillery fire that is suspended when radar detects approaching aircraft. Thus, these Controlled Firing Areas are not shown on the sectional. Be careful around any military facility, however, especially along a coast line. Will radar pick up your small ultralight's reflection in time to stop the cannon fire? Good question! sectional and you will see brief notes and depictions that indicate restrictions. Minimum altitude for fly-over is 2,000 AGL. A violation here could result is stiff fines. Landing in such an area may take place only in an emergency or, otherwise, only at designated landing sites. Things Change -- Presidents and other important people who require high security show up everywhere from time to time, air shows open and close, natural disasters suddenly command attention, runways close for repairs, etc. Be aware of current events in your area, events that might change airspace demands. If you have a question, a call to your local Flight Service Station will answer it. A stands for airspace Above FL 180 extending up to FL 600. B stands for Big Time or Big City, complex Class B airspace. C stands for Cities of moderate size where air traffic is controlled. D stands for Dime Sized or Diminutive cities with controlled traffic. E stands for Elemental, Everywhere or Universal airspace. G stands for Go-For-It, uncontrolled airspace. MOA stands for Military Operating Area. Once you have entered any controlled airspace with ATC permission, you must notify ATC of any deviation from your flight plan, must accept radio instructions from ATC, and cannot seek refuge under FAR, Part 103. If you are permitted into controlled airspace, you are expected to follow the rules that apply to general aviation aircraft while in that space. If you can not safely comply with any order from ATC, you must inform them at once. 1. Contact your local community college, or an FBO, to see if you can enroll in a private pilot ground school class taught by a Certified Flight Instructor. In these classes, they will recommend texts and training materials. Costs are usually low, especially at a community college. 2. You may be able to find, through friends or through a local library, ground school training videos produced by Jeppesen Sanderson, Inc. and by King Pilot Schools. 3. Buy the latest edition of the Private Pilot Manual produced by Jeppesen Sanderson. 4. Buy the Flight Guide: Airport and Frequency Manual published by Airguide Publications, Inc., 1207 Pine Ave., P.O. Box 1288, Long Beach, CA 90801. There are three editions, one each for the far west, the middle west and the eastern U.S.A.
5. Study Federal Aviation Regulations (FAR) Parts 91 & 103, including Advisory Circulars 103-6 & 103-7. 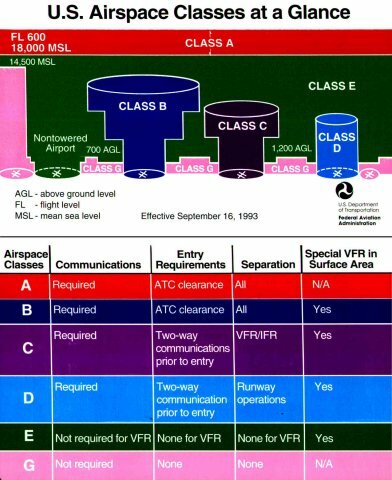 The FAA also offers colorful charts showing airspace, the use of aircraft communication, etc. Write to: Publications, Federal Aviation Administration, 800 Independence Ave. S.W., Washington, DC 20591; or, see the FAA home page on the Internet. 6. Read: Huges, Curtis. The ultralight pilot's flight training manual. Irwin, PA: A-1 Productions, 1994. 7. The Aircraft Owners and Pilots Association publishes annually "AOPA Aviation USA" that lists landing facilities, radio frequencies and items of information pertaining to every public use airport and many private fields as well. It is an excellent idea to join and support one or more aviation organizations such as AOPA, Experimental Aircraft Association, United States Ultralight Association, Aero Sports Connection, etc. Credits: This project was undertaken by Julian Taber who had final responsibility for its contents. However, sincere gratitude goes out to the following ultralight pilots who generously shared their knowledge and experience in developing the material: Ron Blaylock, Doug Bullard, Bill Chilcoat, Jack Eppard, Melanie Frey, Jerry Hodson, Brad L. Johnson, Ken Kennedy, Al Kipple, Rick Lemarr, Gil Leiter, Charlie Radford, Robert L. Ranck, and George Sears. We all thank Robert Comperini, owner of the Internet "Fly-Ul" mail list, who brought us together in the first place.